Not that long ago, a war was waged between veal growers, HSUS and consumers. Traditionally, veal was raised in confinement housing, locked into tiny little areas where the calves couldn’t move around and fed milk and more milk. This was done to keep the meat white and tasteless. Over the years, the standards have changed to group housing where the animals are allowed to move around and compete for food. A couple of years ago, we set out on a path to find out what to do about the stigma surrounding veal. Most people will visibly cringe when I tell them I raise veal. What we do here is MUCH different than normally seen here in the United States. Since we live in a dairy “district” so to speak, we have an outlet to many bull calves. Nearly all of the bull calves from the dairy industry land in the local auction barns and are sold as bob veal or raised as beef in other states. Having a couple of dairy cows ourselves and no way to sell or dispose of the milk, we started researching options on different avenues to add value instead of just dumping the milk. My original inquiries lead me to @HeavesFarmVeal who raises rose veal in the Lake District in the UK. I watched their videos, talked with them via twitter and email. Learning all I could about what they do, why and how. I also stumbled upon @StraussMeats, which is a supplier of humanely raised beef and pastured veal. I started discussing veal with potential consumers, discovering the concerns over welfare and health of the animals. Combining everything I had researched and learned, we raised our first rose veal animal in 2011. He was born to our rescued Jersey cow, Belle. We left him on his momma, drinking all the milk he wanted and tagging along with her as she would eat hay and pasture grasses. He was never given any kind of grain and was watched closely for health. We butchered him at 6 months old (don’t get mad yet, I’ll explain some more in a minute) and he dressed out at 200 lbs. We still hadn’t eaten any yet, but he was a good solid weight and his meat was a beautiful pink color with slight marbling. 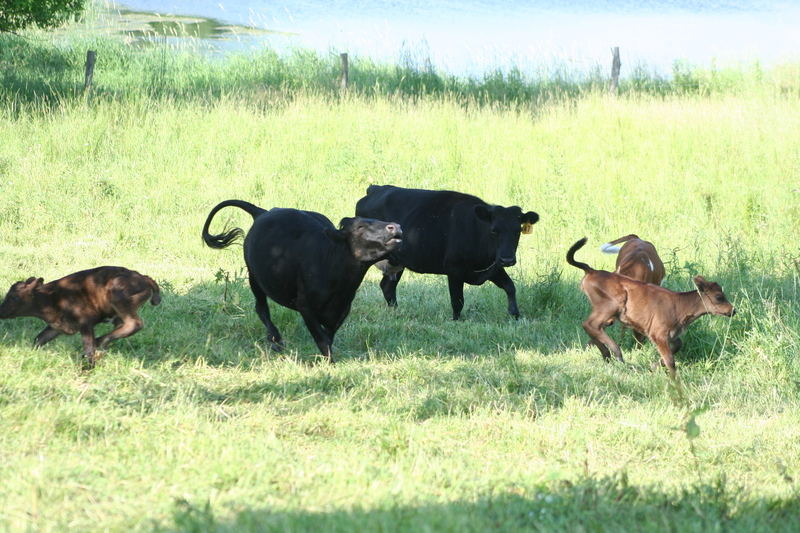 All the cattle here enjoy pasture playtime! Now let’s discuss this age thing. Trust me when I say that I know most people get upset when I tell them the age of the animal. I want you to remember a couple of things…. 1) Most of you have no issues with eating chickens. Well, most commercially raised chickens are actually butchered between 6 and 12 weeks (YES, WEEKS!) old. Under that same mentality, why would a 20-24 week old calf be different? 2) Hormones start kicking in on cattle around 6 months of age. Let me just say that once hormones kick in, they aren’t adorable long eyelashes, baby deer looking animals anymore. They can get aggressive and try mounting anything/everything with a pulse, humans included. Six months of age is the cut off age because puberty will alter the flavor of the meat too. How are we different? We are different because we use the natural systems and the best pastures possible! Each and every calf is raised with lots of love and a great deal of hands on attention. This is done to ensure the highest quality of meats at the time of butcher because they are used to being around people. These animals are never stressed. They aren’t castrated, banded, dehorned or altered in anyway shape or form. They are fed whole milk from our farm, from cows that are also pastured on the highest quality grasses and hay possible. No veal calf is ever treated with any type of antibiotic, growth hormone or boxed at any time during their lives here. After tasting the meat, I’m sold on this system. The meat, again light pink in color with a little marbling, has a delicate and light flavor profile. It’s soft texture melts in your mouth and it “takes” spices very well. We do not raise thousands of these animals a year, instead keeping our numbers small enough to give each animal the time devotion we feel is needed. We have strict methods of rearing these animals too, based off all the information gathering we did from consumers to farmers alike. We work hard to develop a product that we are comfortable with producing and selling. One thing we don’t like around here is confinement. We love being able to sit in the pasture, watching everyone graze or lounge in the sunshine in a lush bed of green grass. 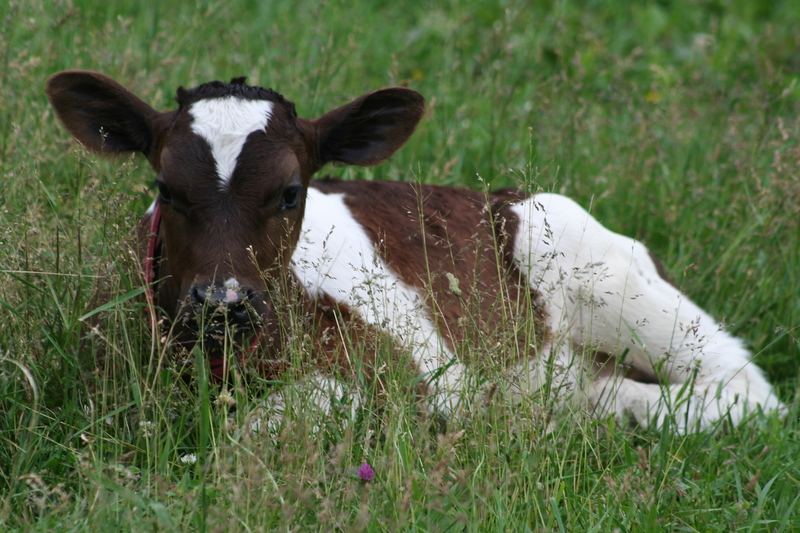 We do our best to give every animal here the absolute best life possible… from chickens to calves to full grown cows. All livestock are put on pastures as quickly as possible. Many have started nibbling grasses as early as two days of age. If you are looking for veal raised with compassion, consideration and humane, look no further! We will have some available for 2015. We are also taking orders now for the season. Contact us for more details. IF YOU ARE A CHEF, BUTCHER OR BLOGGER, WE WOULD LOVE TO SHARE YOUR TIPS, RECIPES AND LINKS! All links can be forwarded to @CNYFarmGirl on twitter. Previous PostOpen Transparency or Is it?